480,000 kg of accessories from landfill as of December 2012. There was even more to celebrate with the recent success of the non-profit's Memory Muster campaign, which rewarded Australians for recycling their old mobile phones with prints of their favourite photos, which were also part of a national photography competition. The birthday event exhibited the finalists and winning photographs from the campaign and welcomed the winners from behind the lens, giving them the opportunity to rub shoulders with some of their favourite celebrities. 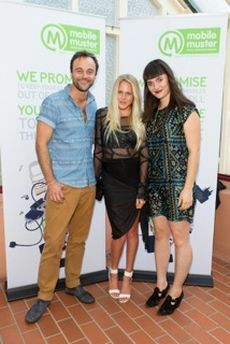 ARIA nominated singer Lisa Mitchell, Former Junior World Champion Surfer Laura Enever, and Logie Award and AFI Award winning actor Gyton Grantley, attended to show their support for MobileMuster. Other attendees included independent MP Alex Greenwich, Natalie Isaacs of 1 Million Women, and Tim Silverwood – Founder of Take 3 and TEDX circuit speaker. "We have some great organisations and people behind this program and last night's celebration was a great way to thank them as well as showcase the results we have achieved to date on our mission towards building a more sustainable world," - Rose Read, MobileMuster Manager. Check out the benefits of recycling your old mobile phone at the MobileMuster website or find your nearest collection box!